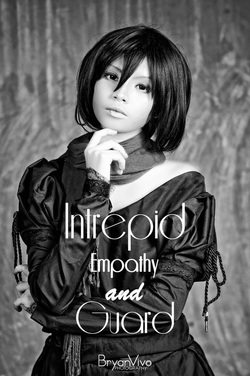 Bryan Vivo is a photographer from the Philippines who specializes in cosplay photography. The shoot I have decided to focus on here is from the Japanese anime series "Shingeki No Kyojin" (Translated as "Attack On Titan"). The photoshoot differs from the tradition 'action' shoots that Paolo Panganiban creates, as this one focuses on being in the style of a fashion shoot. This surprised me, as the anime is based around action and gore. Firstly, I like the use of the lettering on the photographs, especially with the two different fonts and various sizes. The words in each photograph link directly to the character being cosplayed. 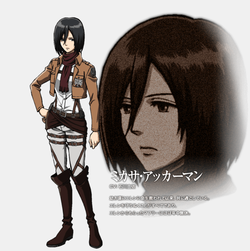 In the photograph to the left, the character is "Mikasa Ackerman" who is one of the main protagonists of the series. 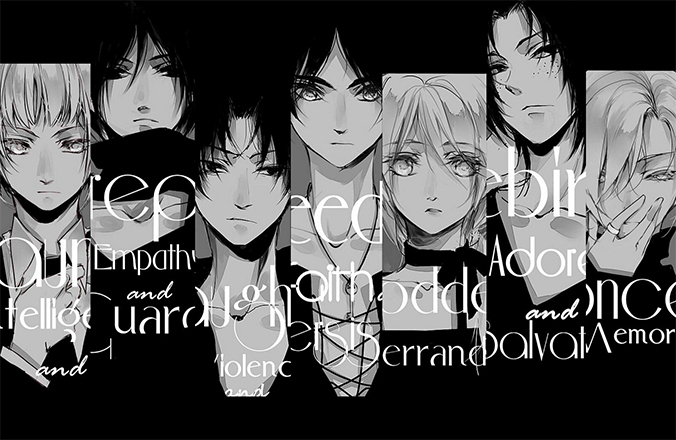 She very rarely shows emotion, and kills without mercy, however she has a strong obsession to protect her friends. The text in this photograph supports this, with "Guard" being the need to defend her companions, and "Intrepid Empathy" being used to describe the characters personality: Fearless. I really like the use of monochrome colours in this photograph, it creates a neutral atmosphere and supports the vacant expression on the models face. There is a lack of emotion in this piece, which as stated above, perfectly fits the character being cosplayed. The scarf is a key part in this photograph - being the only piece of clothing that truely resembles "Mikasa" as it is the one object that sets her apart from the other characters. All the anime characters wear the same uniform, yet Mikasa wears a red scarf as a extra accessory which also has a key significance to the plot. I love how Bryan Vivo has captured the serious nature of the anime in his photoshoot: neither of the photographs have the model expressing any prominent emotion, instead they seem to be deep in through. I find the ratio of colours in the second photograph to be very balanced: the grey, white and black each take up roughly a third of the photograph. I personally prefer the composition in this second photograph, as there is a considerable amount of background behind and above the model. On the contrary, the first photograph has less space around the model, which makes the image seem a lot busier and cramped. I believe this photoshoot was taken in a studio, using wireless lamps for the light set to the right of the models. In my opinion, the most interesting part of this shoot is the use of text that links to the characters. In this photograph, the character being cosplayed is "Annie Leonhardt." 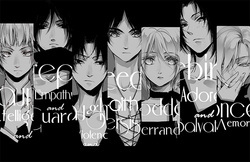 The character betrays her friends and becomes the antagonist in the series. 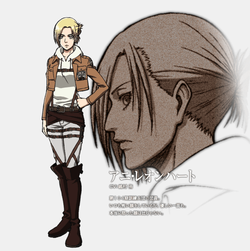 The model is wearing a silver ring in this photograph, and much like Mikasa's scarf, this links primarily to the plot as it is the object that the character uses to fight with. Once again, I admire the attention to detail in this form of photography. Compared to the usual cosplay photography style, Vivo has taken a fashionable approach to this shoot, using black clothes to draw the eye to the light areas - particularly the models face. Please take note that the two significant props - the ring and the scarf - both feature in this piece of artwork. In this section are two scenes from the anime that show each of the characters.